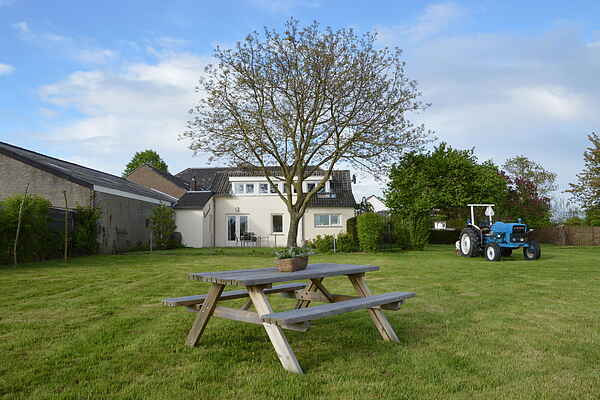 Between Valkenburg and Klimmen lies this nice holiday home in the beautiful rolling South Limburg hilly landscape. The house has an enclosed garden, so children can play freely. The house is bright with large windows so you have unobstructed views over the expansive landschap. For bike lovers this is an ideal place, the house is set on the route of the Amstel - Gold Race ( a famous bike race route). The house has its own storage / bike shed where you can store your bike safely. In the neighbourhood you will find many tourist attractions. At approximately 2 km away Valkenburg offers beside the cozy picturesque downtown attractions such as: Spa 2000, the Casino, the marl caves, the castle ruins and park the Valkenier. The beautiful historic cities of Maastricht and Aachen are within a stone's throw away and Landgraaf where you can visit the gardens of Mondo Verde and also indoor ski Snowworld. A special way to explore the region is with the historic steam train of the South Limburg Steam Train Company which stops in nearby Simpelveld.